UNIQUE TOOL HANDLES Choose from an electric drill, pliers or a hammer! When you love to build, you always want to have a tool in your hand, and with the Decodyne Builder at Work Series Coffee Mug, you can brandish a tool even when you’re drinking your coffee, tea or cocoa! 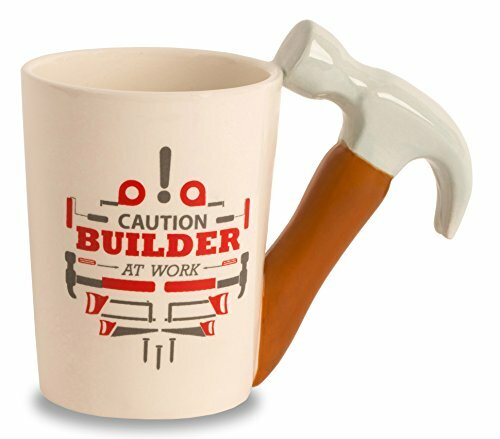 Constructed out of the finest ceramic materials, the Decodyne Builder at Work Series Coffee Mug is a 14 ounce coffee mug that says “Caution Builder at Work” on the front. The lettering is surrounded by tools like tape measures, paint rollers, screwdrivers, hammers, saw and nails. The red and grey image is printed, not a sticker, ensuring durability. The graphic isn’t the only thing that makes the Decodyne Builder at Work Series Coffee Mug unique. This novelty coffee mug also has a three-dimensional handle that is shaped like a tool. You can choose the brown and grey hammer, the red and grey pliers or the yellow and black electric drill when you place your order. Each handle is ergonomically designed to allow for an easy grip. Because of the special shapes of the handles, hand washing is recommended. Know someone who builds for fun or as a profession? The Decodyne Builder at Work Series Coffee Mug is a great gift for him! You can give these construction coffee mugs as Father’s Day gifts, Christmas gifts for men, men’s birthday gifts and more! – Anyone else who works with tools! Put together the perfect gift for your favorite builder or treat yourself to the ultimate mug for your coffee break!